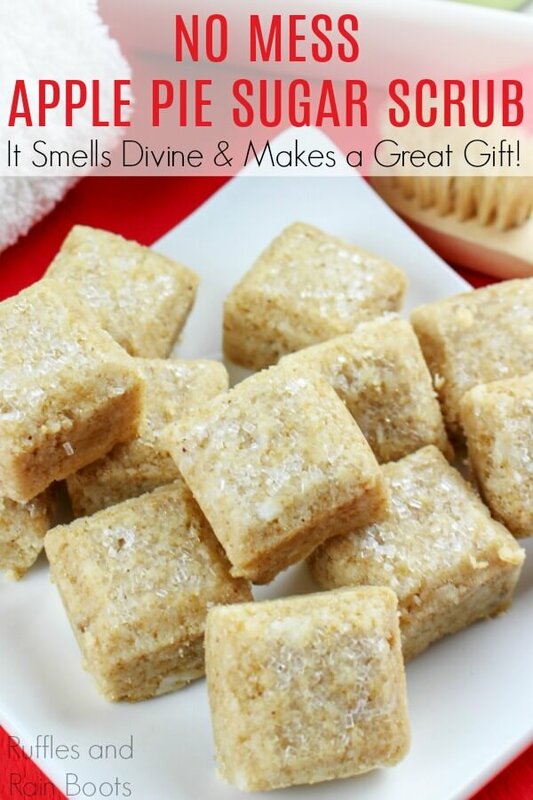 You are here: Home / General Crafts / Bath and Beauty / Apple Pie Sugar Scrub – This Smells AMAZING! 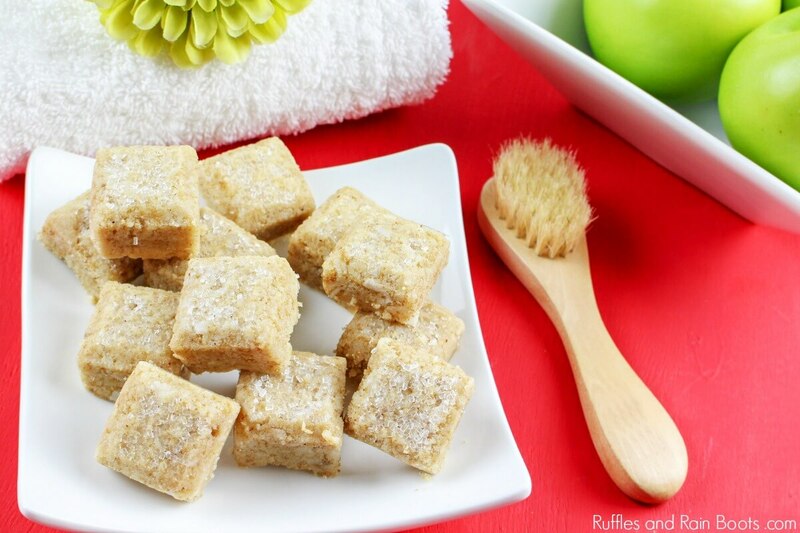 Apple Pie Sugar Scrub – This Smells AMAZING! 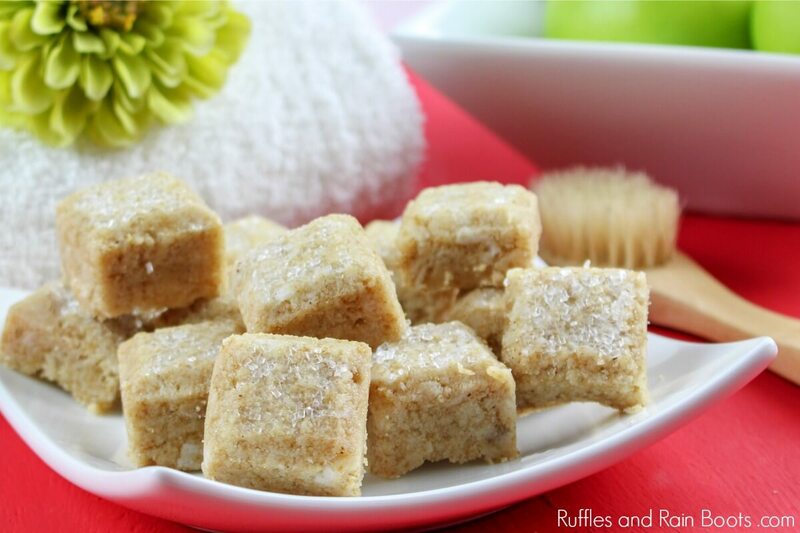 Make this apple pie sugar scrub for yourself or others, but just make it. Comforting smells combined with benefits to the skin – click through to get it all. 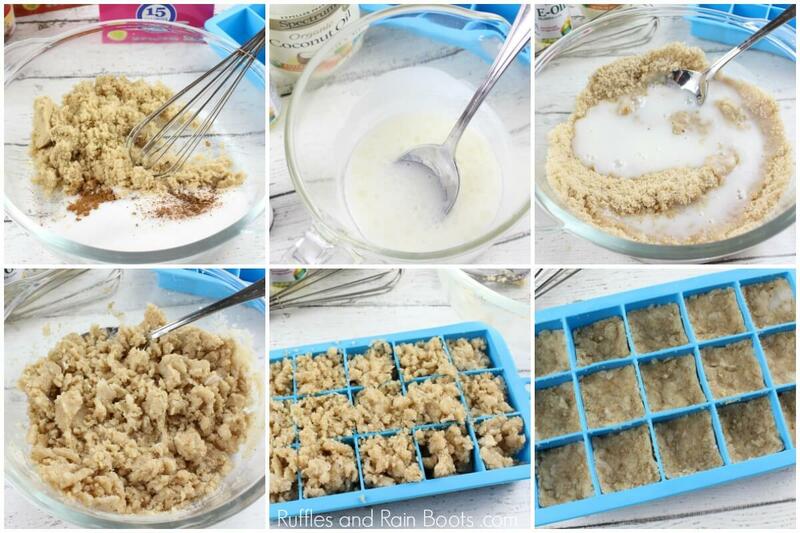 Here on Ruffles and Rain Boots, we love to share our DIY bath and beauty products. From scrubs to shower fizzies, experimenting can go either way. I could fail miserably (and I do) or come up with winning combinations. 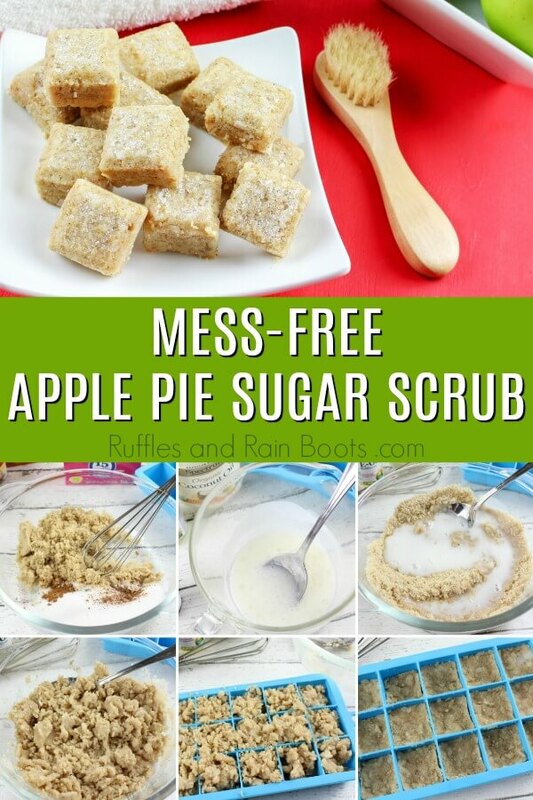 Friends, this apple pie sugar scrub is one of those wins. Take a look at how easy (and quick) this DIY sugar scrub is so that you can get the exfoliating and moisturizing benefits right away. You can use any mold for your cubes but we like this simple square-shaped mold. 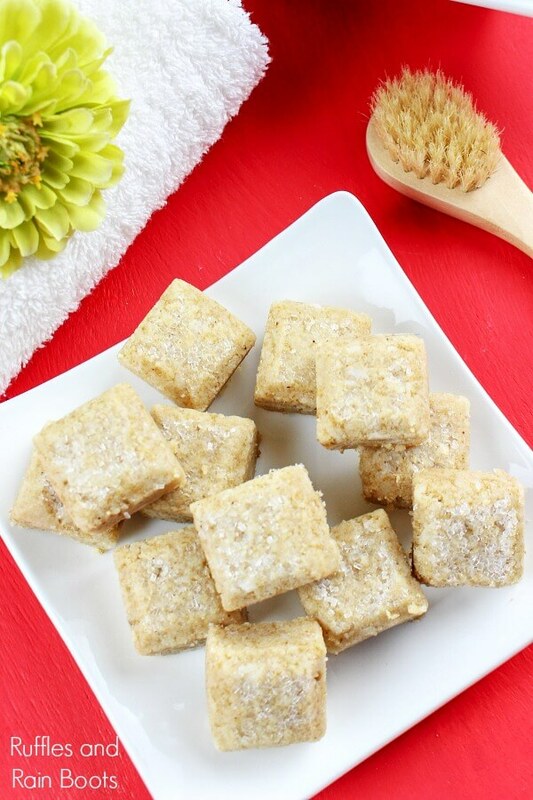 We’ve used it in a few other solid sugar scrub cube recipes and it works each time without fail. Be sure to check out our favorite DIY beauty products in our Amazon store. We only recommend what we use! If you like to watch instructions, scroll back up to see our video on how we made this solid apple pie sugar scrub. Solid scrubs are the best because they don’t make a mess! If you have a playlist on YouTube to which you’d like to add this project, here is our apple pie sugar scrub video tutorial. Sprinkle the granulated sugar into each of the cavities in the mold and set it aside for a moment. In a medium bowl, mix brown sugar, cinnamon, and nutmeg. In a small bowl, add the shea soap and coconut oil. Microwave 20-seconds on high or until completely melted. Allow to cool for about a minute and add the scent. Stir well. Pour the liquid mixture into the brown sugar mixture and quickly stir to incorporate fully. Transfer the mix to the silicone mold and press firmly. Let the mold sit in the refrigerator for an hour to set. Note: if you’re gifting these, include a note with the instructions for use above. And just in case anyone has this question: Even though I added vitamin E oil as an anti-oxidant and it will help to reduce the oxidation of the oil, it isn’t a preservative. The benefits of using it are for the skin.